BASF Antwerp is a large site with ±50 different production and/or storage facilities for various chemical products. 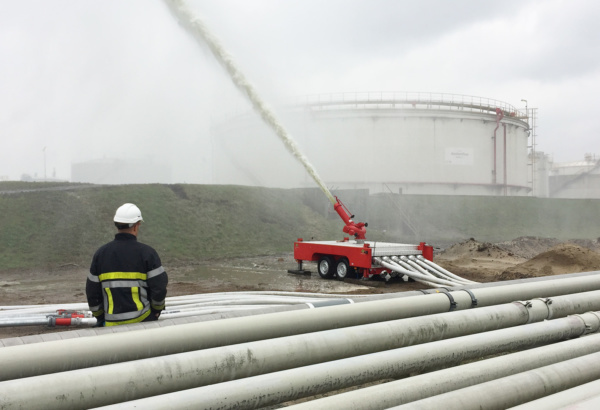 This is a challenge for the fire brigade and other emergency respons teams.The fire department of BASF is very well equipped and trained to cope with challenging fires involving hazardous chemicals. 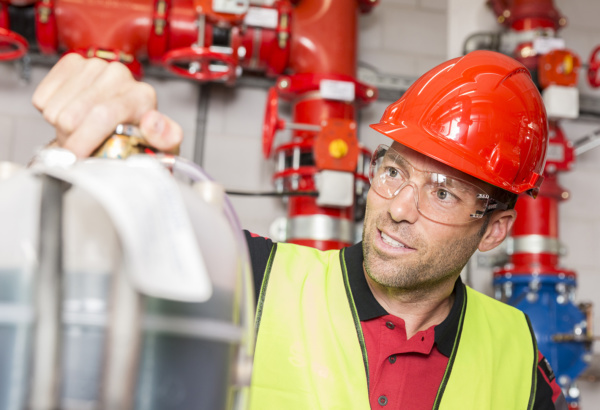 Safety is of the highest priority at BASF. A study was performed regarding two tank pits with four large tanks and seven smaller tanks. The bund areas need a fixed foam suppression system. 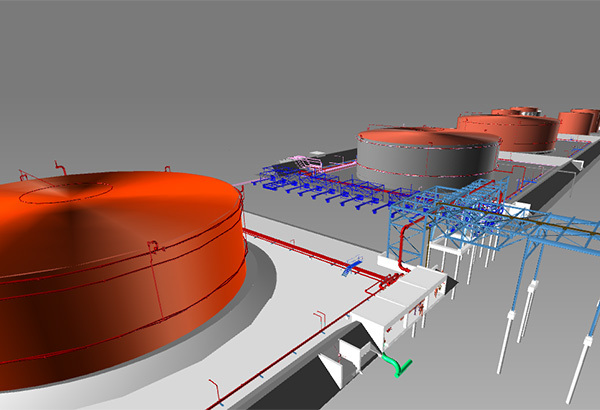 These tank storage areas were already equipped with fixed fire extinguishing systems but were in need of redesign and renewal. The renewal of the systems had to be carried out in a live production environment. 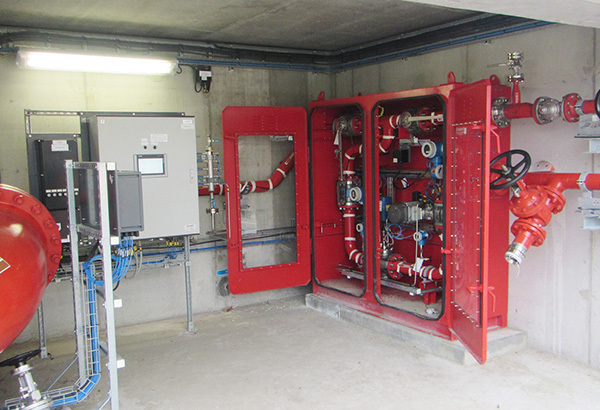 The challenge was to install all new piping and keep the functionality of the existing fire extinguishing system as long as possible. This has been successfully completed and the system now includes additional connections to feed mobile equipment with large capacity. The available firewater capacity is max. 100.000 liters per minute using brackish water from the port, so an inexhaustible source. 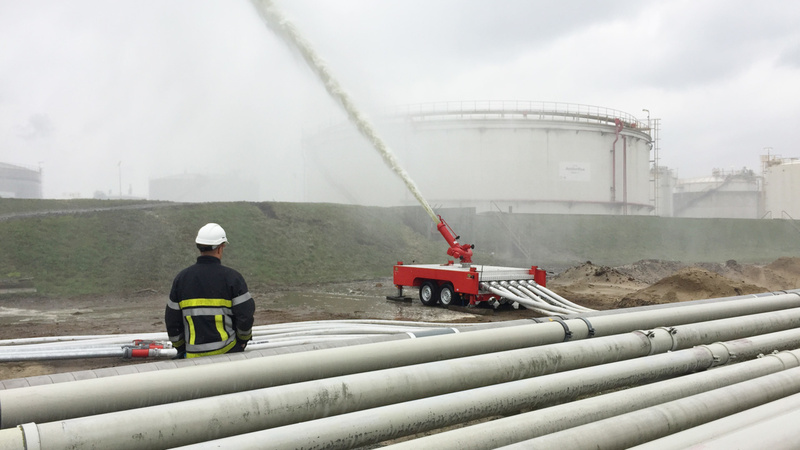 The foam concentrate is stored in two 150 m² storage tanks connected to foam pumps. 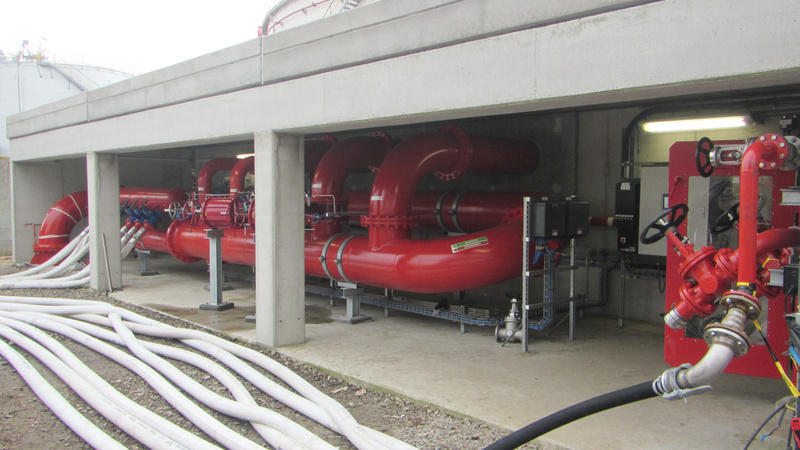 A separate piping network for the foam concentrate has been installed so that it is available on the entire site. For this system we have chosen to use the electronic foam mixer SmartMix®. The system demand for the foam suppression systems varies between 5000 lpm and 45000 lpm. For this area a 3% AFFF foam concentrate is used. 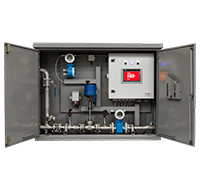 SmartMix® is an electronic foam mixing system which very accurately mixes foam concentrate and water based on the actual firewater demand of the system. 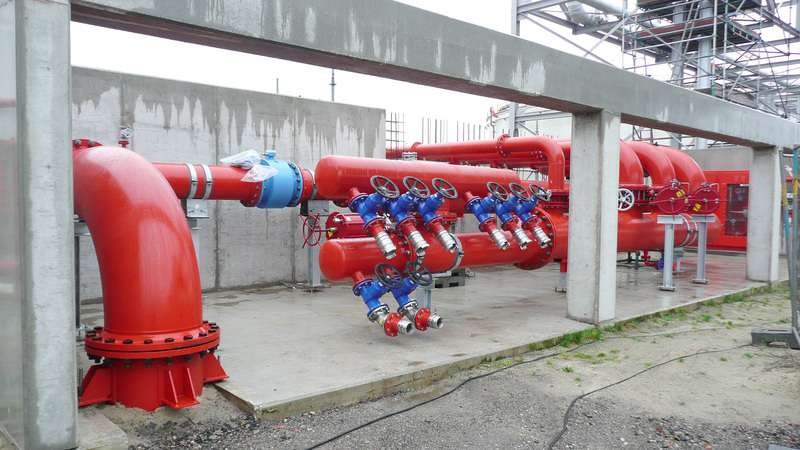 This is achieved by continuous monitoring of the firewater and foam concentrate flows using electromagnetic flowmeters and real-time adjustment of the concentrate control valve.An advantage of the SmartMix® system is that there is no pressure loss in the water supply towards the extinguishing systems. There is only an electromagnetic flow meter installed in the water pipe of the manifold. As a result the new piping diameters could be reduced. Classic foam proportioners require to be tested mixing water and foam concentrate to ensure the proper mixing ratio. Testing of the mixing ratio for mechanical proportioners would create enormous amounts of waste water, use large amounts of foam concentrate and, as a consequence result in serious financial loss. SmartMix® allows system performance to be regularly tested without mixing foam and water, thus avoiding environmental concerns and depletion of costly foam stocks. By using a SmartMix® foam proportioner the cost for annual system testing and the impact on the environment has been reduced significantly. In cooperation with our sister company Knowsley SK we have delivered the SmartMix® delivered as a skid, ready to put in place at the project. 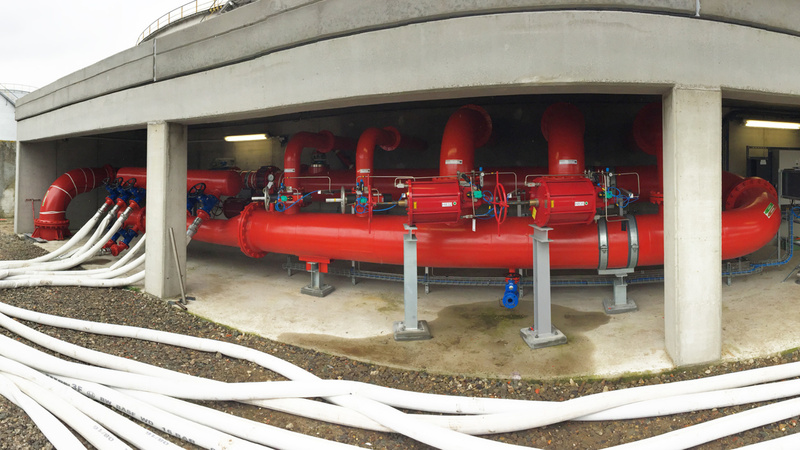 The new manifold is located near the tank pit, behind a fire-resistant concrete housing. After placing and testing the new manifold, the areas where the pipes were to be renewed are divided into smaller zones. The zones were temporarily protected during the work with large mobile monitors. These monitors were connected to the new manifold. All systems have been tested thoroughly to ensure proper operation. One part was testing the SmartMix® foam proportioner. The tests were carried out without using foam concentrate. The foam concentrate was collected in a cleaned tanker for re-use. reduce the total project costs. This has been achieved by allowing the reduction of the pipe diameters within the system. In addition, during commissioning tests we did not use foam concentrate. In the future, the savings will be realized each year by the low costs of the periodic tests and maintenance activities. Do you want to know more about fit-for-purpose solutions?